Several thousand people gathered in the center of Turin to protest against a controversial high-speed rail link between the city and Lyon. The line is slated to run through a small Alpine village. According to the rally’s organizers, up to 10,000 people from all over Italy took to Turin’s streets on Saturday. Local media estimated the number at 4,000 people, La Repubblica newspaper reported. The Italians were protesting the costly project that could also ruin the Susa Valley’s ecology. The protesters got some help from an unexpected quarter: the hacker group Anonymous put a spanner in the works of three websites associated with the project: the court of Turin, the Ministry of Economic Development, and the site of Democratic Party Senator Stefano Esposito, who backs the TAV. The compromised websites were restored by the evening. 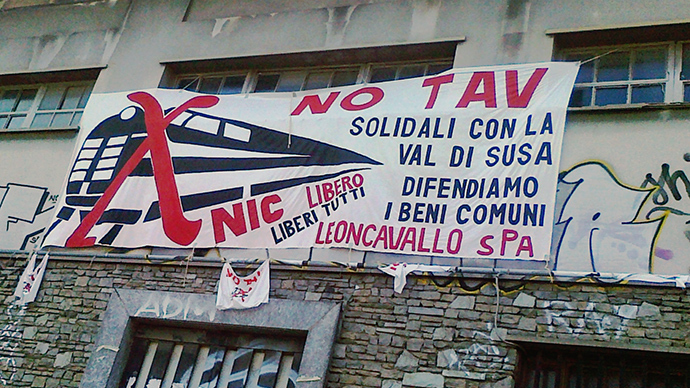 The leader of the #NoTAV movement, Alberto Perino, was present at Castello Square, where the march culminated. He commented on a situation in the morning, when authorities delayed supporters from Milan and Brescia from coming to the meeting because someone hadn’t paid for a train ticket. He also talked about the “heavy sentences,” imposed by the court of Turin on rioters in summer 2011, when massive and violent protests took place. “It's not fair, it is cowardly. This march is the best answer to the judicial authorities that think they can stop us. We are not simply optimistic, we are sure there will be no TAV,” Perino said. Opponents of the TAV project call it a “catastrophe,” as some of the tunnels to connect Italian Turin with French Lyon would be cut through uranium and asbestos ore. The resulting dust would contaminate the Alpine valley. The line is also set to expropriate agricultural lands and cost locals a fortune. Each meter of track costs €153,000, and "every euro spent on the TAV is a euro stolen from something useful for everyone."